Thanks for this guide, great work! is sold by the Enchanter's Study vendor for 1x . I'm trying to design my leveling plan based on the Enchanting quests. The guide mentions the Helping the Hunters quest in Azsuna at level 102, but then at level 108 there is a string of Enchanting quests back in Azsuna. Are any beta testers able to provide insight? Thanks in advance. Blizz is idiotic. While they got rid of tanking/healing necks/cloaks/rings, they still made tanking/healing enchants for those slots. So for offspecs we will still have to have 2 different necks/cloaks/rings. Awesome guide! Thanks for the hard work. I for one am thrilled that there is so much profession content - especially quest lines that explore a lot of lore. One typo I noticed - under Relics, , the formula is erroneously listed as . Looking at the relative material costs for cloak enchants is it just me or does it look like Rank 2 is actually better than rank 3? Rank 3 uses 3 Blood of Sargeras rather than the 2 Blood consumed at rank 2. I imagine most enchanters will have tonnes of spare, cheap arkhana but not so many bloods. Are the other "Boon of the (X)" shoulder enchants really not in this guide? From this are there any new Weapon Enchants to add stats? Is it know whether existing WoD weapon enchants will work on Artifact weapons, or will there be no weapon enchanting other than illusions in Legion? Does Legion disenchanting work like in WoD, where someone with a low profession level can still disenchant Legion gear? Apparently, even though the starter quests do become available at certain levels, you can not pick them up until you have completed the previous set. Thanks for the great guide, I just noticed a small mistake in it as I am doing the quest right now. Prepping For Battle: Create several enchants; Enchant Cloak - Word of Strength, Enchant Cloak - Word of Strength, and Enchant Ring - Word of Mastery. Is there any way in the game to get more dust than what you get atm from one item. Kinda stupid that mining, herbalism and skining has item increase levels, but not enchanting. Dissing 1 item to get 2-4 dust isnt much. And most items cost alot. (Rank 3) is obtained at Honored with not . I found in Dalaran sold by , . Does disenchanting with higher skill level yield more arkhanas and such? Is there no run speed enchant for boots? I'm tired of slow-going in every non-outdoor zone area. I had drop from mobs, but because I am not Exalted with Dreamweavers, I can't learn it. It's sitting in my bank on my enchanter. Hoping Blizzard changes it when they realise how pointless it is to have it as a world drop when you can't learn it without the rep to buy it anyway. So Stupid. Still BUGGED Epic - Disenchanting Legion Crafted Gear! FYI - Crafted Legion BLUE's do work and give Legion Mats back. Makes getting Chaos Crystal's a real pain. I'm not seeing the same stat boost for the enchants that are listed above. For example, "Word of Mastery" for rings' tooltip says Mastery increased by 150; however, the tooltip in my Enchanting list, as well as the enchants I make, say Mastery increased by 56. Am I missing something in the guide, or just missing something? FYI: I just finished the quest, "Ringing True." How do you get the Binding enchants level 1. . One wowhead page says unlock Vendor Kharmeera but no information as to how. She will not give me any quests or items to buy. 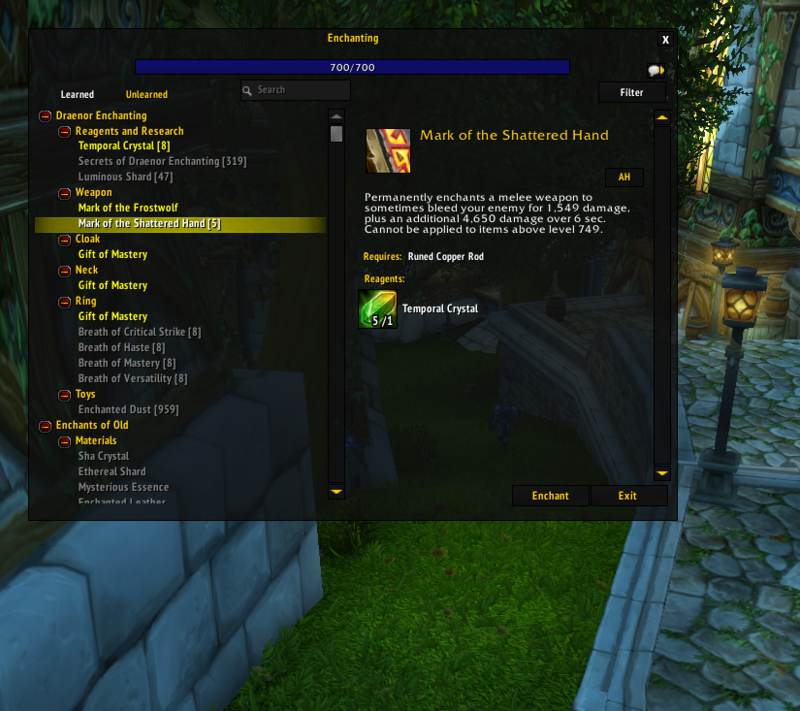 Just want to add that while enchanters can only craft 1 shoulder enchant (the one which gives cloth), there are other shoulder enchants which you can buy from various faction quartermasters (at Honored/Revered rep, depending on the specific enchant). These enchants can only be used on the buyer's own shoulder armor. Is the completion of every set of quest required, as listed, before the next set becomes available? With enchanting I got to level 110 then switched mining for enchanting. It gave me the first quest to craft two versatility rings. Now it does not give anymore quests. Is there something I have to do to unlock the next one or is it a bug? NPC link in the guide is incorrect. This is the right one: Ildine Sorrowspear the one linked in the guide leads to the NPC in DWP/Karazhan. I feel like i must point this out but to me this is a hell of a lot of work and is it really even worth it anymore? Sorry so negative but hasn't blizzard made leveling professions basically useless now with being able to buy gold via WOW tokens nowadays you can just go to the AH and get what you want and or need there,just by using real world gold. Meh, this is just a wall of text. This guide is missing, 'the most cost effective enchants to perform to raise level from 700-800'. I'm rusty but I just reach level 800 enchanting, are there any 800 only recipes/enchants? (like there is in Tailoring). Crafting the Enchanted Torch is 10 felwort not 10 Infernal brimstone. Unlike some other professions you have to be level 100 to get started. Does enchanting have any daily perk?